Suppa saizu mi! | Sugoi Stuff Suppa saizu mi! Home » Lifestyle and Travel » Suppa saizu mi! 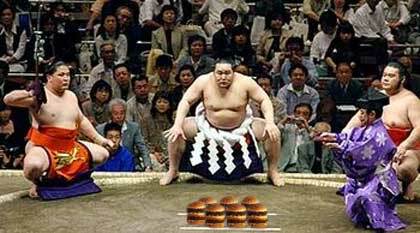 Okay, so whenever I think of “fat” and “Japan” I think of sumo. But get a load of this, the fattening machinery MacDonald’s is now making our ordinary Japanese friends into super sized fatsos. Take a load of this monster. It’s the Mega Mac. A large lard burger with 4 patties. And MacDonald’s Japan made it available this year. Experts say that the generation that grew up eating American food is now reaching middle age overweight and at risk from diabetes. Almost 30 per cent of Okinawan men die before reaching 65, and nearly half of men in their forties are obese. grabe.. parang kailangan ng dalawang bibig para lang makain yun ah..
tsk.. sayang naman.. and to think the Japanese are known for their long lifespans..
Have you seen how the Japanese can manage to stuff their mouths with one whole onigiri? Gasp! Wala yang super Big Mac na yan! what? 4 patties in a burger by McDo? now really, it’s FAT food! The “S” is missing, ano po? Hehe!